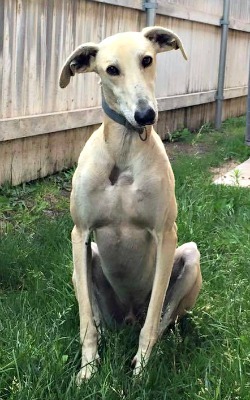 Dobby is a fawn male greyhound who is estimated to be about 2 years old. He was running as a stray in Canyon, TX and was caught by a GALT volunteer. Upon his arrival, Dobby tested positive to the tick-borne disease Ehrlichia Canis. He has now been successfully treated and has completed all his medical procedures. Dobby is living with cats and small dogs in his foster home. He is a very shy, skittish boy who needs a patient family who will let him blossom in his own time.